Welcome to the Kason Badminton website (the "Site"). Kason Badminton, provides services to you subject to the notices, terms, and conditions set forth in this agreement (the "Agreement"). In addition, when you use any of our services (e.g., Customer Reviews), you will be subject to the rules, guidelines, policies, terms, and conditions applicable to such service, and they are incorporated into this Agreement by this reference. We reserve the right to change this Site and these terms and conditions at any time. ACCESSING, BROWSING OR OTHERWISE USING THE SITE INDICATES YOUR AGREEMENT TO ALL THE TERMS AND CONDITIONS IN THIS AGREEMENT, SO PLEASE READ THIS AGREEMENT CAREFULLY BEFORE PROCEEDING. Except as permitted in the paragraph above, you may not reproduce, distribute, display, sell, lease, transmit, create derivative works from, translate, modify, reverse- engineer, disassemble, decompile or otherwise exploit this Site or any portion of it unless expressly permitted by us in writing. You may not make any commercial use of any of the information provided on the Site or make any use of the Site for the benefit of another business unless explicitly permitted by us in advance. We reserve the right to refuse service, terminate accounts, and/or cancel orders at its discretion, including, without limitation, if we believe that customer conduct violates applicable law or is harmful to our interests. We may assign you a password and account identification to enable you to access and use certain portions of this Site. Each time you use a password or identification, you will be deemed to be authorized to access and use the Site in a manner consistent with the terms and conditions of this Agreement, and we have no obligation to investigate the authorization or source of any such access or use of the Site. YOU WILL BE SOLELY RESPONSIBLE FOR ALL ACCESS TO AND USE OF THIS SITE BY ANYONE USING THE PASSWORD AND IDENTIFICATION ORIGINALLY ASSIGNED TO YOU WHETHER OR NOT SUCH ACCESS TO AND USE OF THIS SITE IS ACTUALLY AUTHORIZED BY YOU, INCLUDING WITHOUT LIMITATION, ALL COMMUNICATIONS AND TRANSMISSIONS AND ALL OBLIGATIONS (INCLUDING WITHOUT LIMITATION FINANCIAL OBLIGATIONS) INCURRED THROUGH SUCH ACCESS OR USE. You are solely responsible for protecting the security and confidentiality of the password and identification assigned to you. You shall immediately notify us of any unauthorized use of your password or identification or any other breach or threatened breach of this Sites security. All text, graphics, button icons, images, audio clips, and software (collectively, "Content"), belongs exclusively to Kason Badminton, or its affiliates. The collection, arrangement, and assembly of all Content on this Site (the "Compilation") belongs exclusively to Kason Badminton or its affiliates. All software used on this Site (the "Software") is the property of Kason Badminton, its affiliates or its Software suppliers. The Content, the Compilation and the Software are all protected by Canadian and international copyright laws. 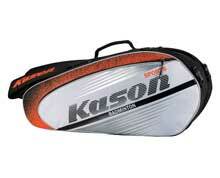 Kason Badminton, Kason, Make the Change and other logos, slogans, trade names or words are registered trademarks, trademarks or service marks of Kason Badminton, its affiliates, suppliers, or third parties. The use of any of our trademarks or service marks without our express written consent is strictly prohibited. You may not use our trademarks or service marks in connection with any product or service in any way that is likely to cause confusion. You may not use our trademarks or service marks in any manner that disparages or discredits us. You may not use any of our trademarks or service marks in meta tags without prior explicit consent. The risk of loss and title for items purchased by you pass to you upon our delivery of the items to the carrier pursuant to our standard terms of sale, which you may access here (insert web page) (and on the webpages to which that webpage links). EXCEPT AS OTHERWISE PROVIDED IN THE STANDARD TERMS OF SALE THAT GOVERN THE SALE OF EACH PRODUCT ON THIS SITE, A COPY OF WHICH YOU MAY ACCESS HERE (insert web page) (and on the webpages to which that webpage links), THIS SITE, THE PRODUCTS OFFERED FOR SALE ON IT AND THE TRANSACTIONS CONDUCTED THROUGH IT ARE PROVIDED BY US ON AN "AS IS" BASIS. WE MAKE NO REPRESENTATIONS OR WARRANTIES OF ANY KIND, EXPRESS OR IMPLIED, AS TO THE OPERATION OF THE SITE OR THE INFORMATION, CONTENT, MATERIALS, OR PRODUCTS INCLUDED ON THIS SITE EXCEPT AS PROVIDED HERE (insert web page) (and on the webpages to which that webpage links). TO THE FULL EXTENT PERMISSIBLE BY APPLICABLE LAW, WE DISCLAIM ALL WARRANTIES, EXPRESS OR IMPLIED, INCLUDING, BUT NOT LIMITED TO, IMPLIED WARRANTIES OF MERCHANTABILITY AND FITNESS FOR A PARTICULAR PURPOSE, NONINFRINGEMENT, TITLE, QUIET ENJOYMENT, DATA ACCURACY AND SYSTEM INTEGRATION. THIS SITE MAY INCLUDE INACCURACIES, MISTAKES OR TYPOGRAPHICAL ERRORS. WE DO NOT WARRANT THAT THE CONTENT WILL BE UNINTERRUPTED OR ERROR FREE. You agree that our remedy at law for any actual or threatened breach of this Agreement would be inadequate and that we shall be entitled to specific performance or injunctive relief, or both, in addition to any damages that we may be legally entitled to recover, together with reasonable expenses of any form of dispute resolution, including, without limitation, attorneys fees. No right or remedy of ours shall be exclusive of any other, whether at law or in equity, including without limitation damages injunctive relief, attorneys fees and expenses.